There is something unerringly strange about dolls in what Marina Warner in Phantasmagoria called 'their ever protracted undecided state, between life and not-life.' Japanese roboticist Masahiro Mori's theory of 'The Uncanny Valley' holds that when human replicants look and act almost, but not perfectly, like human beings, it causes a response of revulsion; the 'Valley' is the dip in the comfort level of humans when confronted by these doppelgangers. With these terrors and strangenesses in mind, Duplicity travels headlong into Masahiro’s valley, probing human sensitivity to explore the psychological drama of the dip when misleading appearances are designed to deceive and false substitutes replace the real. Mike Bartlett makes masks from a cast of his own head and layers them with the faces of friends some here, some gone – these composite simulcra are the subjects for a series of Mask paintings. Kirsty Buchanan is interested in the power of representational tokens such as votive objects and mementos, and the unearthliness of being able to experience your own body from an external viewpoint, something that we take for granted with our familiarity with film and instant photography. Ruth Collins takes the ambience of Ibsen’s A Doll's House, as the starting point for an installation that uneasily reveals obscured interior details. 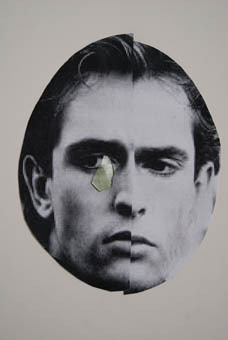 Alex Michon charts the narcissistic and psychological shatterings of two famous libertines, Arthur Rimbaud and Rupert Everett, utilising mise-en-scene costuming, mother of pearl painted necklets, chandeliers and snow globes. Cathy Lomax takes Tennessee Williams' Baby Doll as the starting point for an examination into obsession, narcissism and an uneasy reflected sexuality. Alli Sharma focuses on our culture’s obsession with weddings where girls take centre stage in the romance narrative. The too-perfect bride is an impossible, artificial stereotype that parallels Angela Carter’s symbolic soubrette to embody a social ideal of femininity that obscures the real. Eloise Rose investigates a descent into mental illness inspired by Conrad Aiken’s 1934 short story Silent Snow, Secret Snow. The blankness and purity of snow becomes a metaphor for purging the mind of all externality. Transition has produced a number of publications examining ideas relating to the themes in Duplcity. These are available from the Transition Shop or online.